Goals from Fernando Llorente (£6.1m) and Tom Carroll (£4.1m) helped Swansea City to a 2-0 win over Stoke City, with Carroll handed maximum Fantasy Premier League bonus points. The Swansea midfielder also contributed four recoveries and won two tackles, completing 84% of his 44 attempted passes to accumulate a Bonus Points System (BPS) score of 31. Goalkeeper Lukasz Fabianski (£4.8m) collected two additional points as his defence earned a third clean sheet from their last five home matches. Fabianski made three saves and 17 recoveries to score 29 in the BPS. Despite being withdrawn after 58 minutes, Llorente’s first strike since his Gameweek 27 brace against Burnley was enough to earn the final bonus point on offer in Saturday's contest. 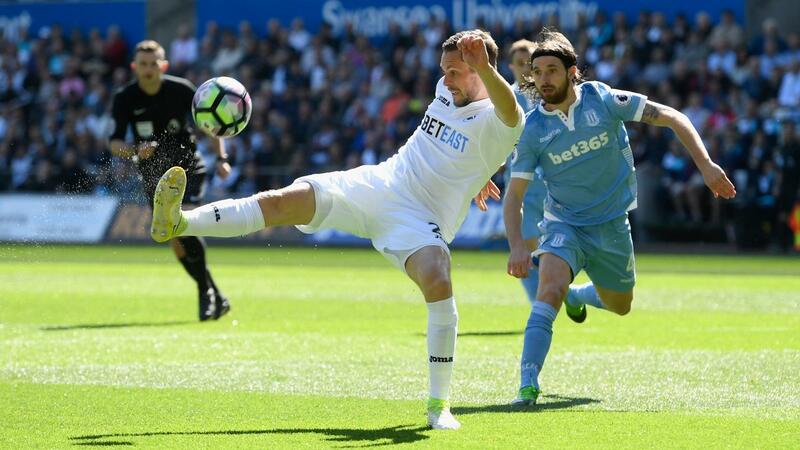 Gylfi Sigurdsson (£7.5m) provided the assist for Swansea's opener, his first points return for five Gameweeks, to top the ICT Index with a score of 8.5. The Iceland international enjoyed more touches in the Stoke City penalty area than any team-mate (seven) and fired two shots from inside the box to score 30 for Threat. Top scoring with 34 for Creativity, Sigurdsson also attempted 16 crosses and supplied a pair of key passes. Jordan Ayew (£5.0m) ranked next in the Index, registering 8.4 for his best tally of the season. The forward, who provided the assist for Carroll's goal, hit the target with two shots from inside the box to score 36 for Threat. Following his 12-point haul in the 3-1 win over Hull City in Gameweek 33, Stoke’s Marko Arnautovic (£7.1m) appeared to be a possible short-term differential for managers yet to play their Wilidcard. Stoke face a home fixture against West Ham United next weekend, but with the midfielder missing a second-half penalty, he may now surrender responsibility from the spot for that Gameweek 35 match, denting his potential. Elsewhere for the Potters, manager Mark Hughes handed a first start of the season to fit-again goalkeeper Jack Butland (£4.5m), with Lee Grant (£4.4m) dropping to the bench. Having started every match since making his Stoke City debut in Gameweek 6, Grant had been a hugely popular budget FPL option, and was part of 415,000+ squads ahead the weekend defeat. But with Butland hopeful of retaining his start for the rest of the season, Grant’s 9.2% ownership will need to turn to their back-up goalkeeper or enter the market for a replacement. Grant is already the most-sold goalkeeper since being dropped on Saturday, with more than 3,600 moving him out. For Swansea, head coach Paul Clement tweaked his formation and deployed Sigurdsson at the tip of a midfield diamond behind a front pairing of Llorente and Ayew. That system could feature again when the Swans travel to Old Trafford to face Manchester United in Gameweek 35.